Like any photographer, I love exploring the beauty of nature and recording the effect of light as it influences what I see. The uniqueness of creation and the influence of life (humans and animals) provide great magnetism to my shutter finger. My creative side started while shooting slides and Black and White film as a teenager and progressed into manipulating Black and White silver halide prints as an adult using an enlarger and wet process. Now in my later years, I've adopted digital imaging and haven't looked back. I can do things today in 3 minutes in Photoshop that used to take as long as three days on an enlarger. This has allowed me to improve my B&W imaging greatly. I have been involved in photography for more than 60 years. Along the way I received a masters degree in Image Science from Rochester Institute of Technology and retired from Eastman Kodak Company in 2002. The post-graduate degree helps me better understand what I am doing but contributes only slightly to helping me get better pictures. During the earlier part of my 36 years at Kodak I was involved in aerial photography, photographic paper design, and graphic arts. During the last third of my tenure at the "Yellow Box" I managed the design of silver-based and chromogenic Black and White photographic papers, like Polymax and Ektamax II. Along the way I picked up numerous photographic design patents. Having visited over 300 B&W Kodak Clients and being immersed so deeply into the field I learned to "see in B&W". Not easily explained. The recent images in this website were digitally collected. The older ones ( such as from Italy) were first captured on film, scanned and then mastered. Many of the Black and White images were collected on film and then printed on silver halide paper. The final image was then scanned on an Epson 4990 Photo flatbed scanner. Silver halide methods are a retired process for me since I sold all my darkroom equipment and have gone fully digital. I retain quite a few B&W images I made before the demise. 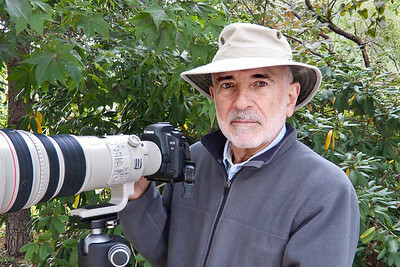 Currently I use a Canon 5D sR digital camera with Canon L lenses. Yeah, 51 megapixels! Trying to keep the weight down I limit what I carry to the following things in my Lowepro Mini Trecker backpack: the Canon L 16 to 35 mm II lens, the Canon L 24 to 105mm IS II lens, a Canon 100mm L IS macro lens and the Canon 70 to 300mm L IS lens. I have 2 Sandisk 64 extreme CF, two 64GB extreme SD back up cards and a bunch of older 8 Ultra gig flash cards. My "Big Bertha" Canon 500mm f/4 IS lens is too big for the bag. And I occasionally use it with a 1.4 II extender. Since I rarely used the 500mm and extender I sold them and as soon as I did I was sorry. But it was too big and heavy. I replaced it with a Sigma 150 to 600mm lens. It is very good. I frequently use a shutter release when the camera is on the tripod. I carry a light Velbon carbon fiber tripod with a Right Stuff big ball head. I also have a Canon 430 flash that I rarely use and I have the remote trigger. I carry two extra batteries and protect everything in the bag so it continues to look brand new. I minimize the filters I carry to a couple NDs (4 and 10) and a circular Polarizer. With step up rings to match the uncommon lens sizes. I also carry on my belt an awesome Panasonic DMC LX7 point and shoot camera. Also in the bag are battery chargers for two cameras. I added a CamRanger and an iPad to the bag. It is getting heavy! Photo of me taken by Vaughn Hadenfeldt, my field guide, of "Far Out Expeditions" with my Panasonic LX1 Point and Shoot camera. The quality of this camera for its size is outstanding. I now have the LX7 version. It is even better. I shoot in raw format with both cameras. I love shooting panoramas and stereo. I love to mentor budding photographers. I have taught photography in Santiago (Chile), Sao Paulo (Brazil), Mexico City, Toronto, and countless times in Rochester, NY. I taught "Black and White with Dave Valvo" (an instructional program how to improve your B&W images) at the March 2014 Can Am Photo Expo in N. Tonawanda, at Camera Rochester in Feb 2014 and Canyon Camera Club April 2014. I gave the program at AM Camera Club Sept 9, 2014, Twin Cities Camera Club Oct, 14, 2014, Geneseo Camera Club March 19, 2015 and Loudoun County Camera Club in Virginia April 9, 2015. I gave an improved version to Batavia Camera Club April 18, 2016 and Southtowns Camera Club April 21, 2016. I gave a program "Judging photographs" at Camera Rochester in October 2014 and Canyon Camera Club Dec 3, 2014. I gave a different program "Winning in Competition" at AM Camera Club September 8, 2015 and Museum CC September 16, 2015. And at Twin Cities CC in Buffalo 1/20/15. I am currently giving a program that teaches people how to improve their imaging methods in the field. 2018 Finger Lakes Photo guild, Greece Public Library, Twin Cities Camera Club in Buffalo, the Science Museum Camera club in Buffalo, Southtown Camera Club in Buffalo and the AMD Camera Club in Williamsville, NY. In April 2018, I judged the Tidesland Camera Club (PSA) competition. In December, 2018, the Layfayette Camera club (PSA) competition. August 2017, I Judged the Lafayette Photographic Society (PSA) competition. Part of a team of three judges I judged the 2017 Mid-West PSA Council Challenge. I judged images at AM CC Sept 9, 2014 and Sept 8, 2015.; at Camera Rochester in June 2015; at TCCC April 28, 2015 and at Park Ave festival August 1, 2015 and 2016. I judged the 2015, 2016, 2017 and 2018 American Society of Civil Engineers International Bridge Competition. Seven Categories. I judged the 2017 Fort Myers Camera Club (PSA) year end competition. If you are interested in private lessons please contact me via email at DaveValvo@rochester.rr.com. Please enjoy the website. Also please sign my guestbook and tell me which images you like. It will encourage me to shoot more. Member: Professional Photographers of America 2012; Canadian Association for Photographic Art 2009; Camera Rochester 2010 to 2016; and the Photographic Society of America 2016 - 2919. Many of my Drum Corps images, from the past few years, are published in the International Drum Corps World magazine. I am a staff photographer for the magazine. It is volunteer work. 5 of my images have made the cover. I am also a staff photographer for Genesee Country Museum... another volunteer item. Accolades: Awarded "Hometown Favorite" award (Fireworks over the Town Hall) for Town of Greece Photo Contest 9/25/15 and "Best in Show" 10/2/15 at Hilton Apple Fest with "Mosque" This is my last award entry... What follows is previous years. 5/4/15 Perfect score (15) for 2 B&W prints "Balloons over Letchworth State Park" and "Rebels". Two 13 scores for "American Gothic" and "Eagle Lake". 3/22/15 CanAm Photo Expo > Second place Monochrome for "Retreat", Second place color peoples choice award for "Mystique" and 5 other honorable mention awards for Monochrome prints, "False Kiva from high"; Color prints, dual toned "Grain City"; Digital Pictorial, "Mystique" and "False Kiva from high"; Digital Wildlife "Bald Eagle at Homer". 3/2/15 Camera Rochester > In Monochrome prints "Refreshing" scored 14/15 and "Christmas cactus" scored 12/15. In digital, "Run - Retreat: scored 14/15. 1/5/15 Camera Rochester >> full year awards > > First Place in Digital for 2014; First Place in Assigned Category for 2014; Second place in Monochrome for 2014. 1/5/15 Camera Rochester, Highest Scoring Digital image, "Resolved Awareness" a B&W print from GCVM. Second and Fourth highest scoring images in Monochrome; "Grain Silo" and "Calvary" . 11/15/14 Score of 29 out 0f 30 in NFRCC McKeller competition for "Moon Over Death Valley". 11/7/14 to 1/30/14, Exhibited 8 Prints at Image City B&W Invitational, images featured "Places of Power". 11/3/14 Camera Rochester, First Place Digital with Grain Silos; Second Place Monochrome, Sun Flower. 10/30/14 HM for "Moon Over Death Valley" 2914 McKellar NFRCC competition Award; rated 29 out of 30 points. 10/6/14 Camera Rochester, HM digital for "4th of July fireworks over Freddy Sue Bridge"
10/4/14 Hilton Apple Festival Photo Contest; First and Second Place with "Girl in Yellowstone and Angel Painting." 9/8/14 Camera Rochester, Third place Monochrome for "No Trespassing"
6/5/14 Image of the Troopers was selected to be on the June 2014 cover of Drum Corps World magazine. 6/2/14 Camera Rochester, Third place Digital for "Steel City Ambassadors Color Guard", image was previously on a past cover of Drum Corps World magazine. 5/5/14 Camera Rochester, First place Assigned Category, "Oldies but Goodies" "Questionable Juniper"; Third Place, Digital, "US Flag Reflection". 4/7/14 Camera Rochester, First Place Monochrome for "Rock of Ages" and HM in Digital for "Starry Night on Cadallac Mountain". Members selected an image of "Rochester Skyline at dusk" for the Barnes and Noble poster and gallery show. 2/3/14 Camera Rochester, Second Place in Digital for a color panorama of "Rock of Ages". 1/6/14 Camera Rochester, First Place Monochrome for "Dreamy Stones" and Second Place in Digital for "Live Tidal Pool"
1/6/14 Camera Rochester awarded First place in Monochrome for the entire year of 2013 and Third place in Large Color prints for 2013. 12/1/13 NYS Erie Canal way selected my image of "Dusk Skyline of Rochester" for the cover of the calendar as well as for the month of May. 12/15/13 Panorama image of Civil War re-enactment published in D&C calendar. 12/2/13 Camera Rochester First Place Monochrome for "Bass Harbor Lighthouse" and HM in special "Street Photography" with "Three Girls"
11/29/13 Guest Exhibitor at Image City for the Holiday Show. 4 B&W and 4 Color images. 11/7/13 Exhibiting two color images from Venice at "My Sisters Home. 11/4/13 Camera Rochester: Second Place Monochrome for "Log at Acadia" and third place for "Eagle Lake". HM for "Leaf Dam" in Large Color Prints. 10/7/13 First Place winner Monochrome with "Roadway to Heaven" Camera Rochester. 7/25/13 Sold two of my Rochester Bridge images to the American Society of Civil Engineers ASCE in Kentucky. They will publish 18,000 calendars for 2014. Images sold > Veterans Memorial Bridge over the Genesee and Genesee River Bridge showing rt 390 overhead. 6/3/13 Second Place winner in Monochrome for "Dead tree at Half Dome" and Third place in Large color prints for "Fireworks in the Magic Kingdom". Camera Rochester. 4/1/13 First place winner in Monochrome for Zabrinski point Death Valley and third place with Yellowstone in Winter fence, Camera Rochester. 3/16/13 Winner of Really Right Stuffs "National" winter "Water" theme contest with a B&W "Angel Painting". 3/9/13 At the 2013, NFRCC, I won seven awards. First place in Monochrome prints with Death Valley Moon, First place in Monochrome Peoples Choice, Honorable mention for B&W "the Sheriff", HM Snow shoe runner color print, HM Death Valley moon, HM color prints False Kiva, and HM, B&W Yellowstone "lonely walk" in winter. 3/4/13 First place in monochrome for "The Sheriff" and second place in monochrome for "Solarized Death Valley" at Camera Rochester. Third place for "Horseshoe runner", in large color prints, Camera Rochester. 4/2/12 First Place Large Color prints, " False Kiva", Camera Rochester HM B&W prints, Gorrilla, Camera Rochester. 3/18/12 Currently exhibiting in "A Photographers Path" at Rochester's High Falls Gallery. 3/17/12 NFRCC Hm for B&W print of "Aztec Butte", HM for B&W print of "Costa Rica girl", HM in B&W prints for "Civil War Horse-woman", and HM for a color image of "LION" in Nature Digital Color. 3/1/12 Full size panorama of Frozen Lower Genesee Falls Published in the Democrat and Chronicle Business section. 9/4/11 Centerfold image published in DCA Wold Championships Program. 7/15/11 Sold a special image of Letchworth Portage bridge to the American Society of Civil Engineers. They published 18,000 calendars with similar notecards. 2/26/11 NFRCC Won HM for a B&W print of "Gorilla" and another HM for a B&W print of Two Story Ruins", and HM for a color print of "Shadow dunes of Death Valley". 1/6/11 Won National Grand Prize for Tamron's 2010 Fall / Winter photo competition with B&W "Angel Painting". Won a new Tamron lens. 10/10 Front page image and 6 other images including one almost half a page wide in Drum Corps World October issue. 9/4/10 Centerfold image published in DCA Wold Championships Program. Others in Program as well. 9/4/2010 Staff Photographer for Drum Corps World. 4/24/10 2010 NFRCC, Received second place in B&W prints for "Zabrinski Point" in Death Valley image and HM for a color print of "three fighting Eagles", HM for Color HDR print of "Under the Library" and HM for B&W print of "Angel Painting - Self Portrait". 2/15/10 Presented program on " Some of my Images and How I got them." at Camera Rochester. 11/14/09 Three images published in the book "Capture Rochester '09". "Angel Painting" printed as full page image. 9/4/2009 Staff Photographer for Drum Corps World. 3/21/09 NFRCC. Received First Place Monochrome Nature award, Judges choice, perfect score, and Best of Show for Angel Painting found in "Landscapes, Finger Lakes, Winter Gallery" . Also received another judges choice award in the same competition for a second monochrome image "Ceiling House". Color Version is shown under "Landscapes, Southwest, Ancient Ruins." Also received HM for a color print of the desert dunes. 2/1/09 Winner of "Live the Winter" contest; Visit Rochester for image found in Landscapes, Finger Lakes, Winter, "Frozen Lower Falls"
3/ 20/2008 NFRCC Awarded Second Place in all catagories, Color Print for False Kiva, located in "Landscapes, Southwest, Ancient Ruins". Also received HM for a print of the desert. 1/3/2004 "Best of Show" Howe Caverns 2003 photo competition. Located under Landscapes, Finger Lakes, Summer, Howe Caverns. 1/3/2004 "Best Professional image". Howe Caverns 2003 photo competition.